GmailAgenda is a Greasemonkey script that shows your Google Calendar agenda as a sidebar in Gmail. The script uses Google Calendar's embedded view and it includes an option to add events to the main calendar. The sidebar can't be minimized, so it remains visible even when you don't need it. An alternative way to keep an eye on the Google Calendar agenda is to add the iGoogle gadget in the sidebar, as explained in this post. The advantages are that you don't need the Greasemonkey extension, the sidebar is visible even when you don't visit Gmail and it can be closed. Is it not possible to get my GoogleCalendar agenda in my GoogleReader ? >>>the sidebar is visible even when you don't visit Gmail and it can't be closed. I think you mean "it can be closed." "You can't show "inline-required" type gadgets in the iframe frame. I tried also older version of the gadget, but it still does not work - this time I get: "Informations are temporary unavailable". But on iGoogle page same gadget works. It does work. I tested this in Vista/Firefox 3 and Ubuntu 8.04/Firefox 3. You need to bookmark http://www.google.com/calendar/ig (the post about sidebars included a different URL that doesn't work anymore, but I changed it). Thanks, it works with the /ig link. I liked this, but needed something that would work in Internet Explorer too. 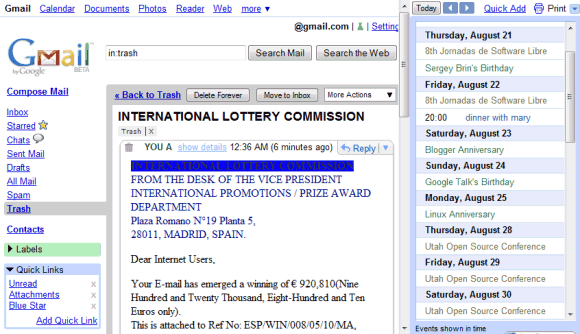 I also was mostly interested in "today's events", and wanted something with a lighter footprint in my GMail window. A small box is added to the left-hand pane, below Contacts and above Chats. Any events starting in the next 24 hours (or that started in the past hour) are displayed in compact form. The list is updated roughly once per hour. Perhaps you'll find this useful? It's a bookmarklet so you need to click it each time you open GMail, but that hasn't been much of a problem for me. It works for me in Internet Explorer and in Firefox, both on Windows. it just disappeared?? How do I get it back? A Directory of Google Reader Shared Pages?